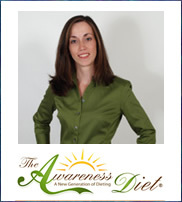 The Awareness Diet is an online weight loss program created by Dr. Stephanie Coate, a licensed psychologist in the state of California with a doctorate in Clinical Psychology and a master’s degree in Transpersonal Psychology. This program emphasizes increasing the awareness of your mind and body so that you can enliven your natural instincts around eating and achieve your ideal body weight without the need to deprive yourself of your favorite foods. The program includes twenty-five sessions and worksheets that teach you how to get in tune with your body’s instincts and to learn to make food choices based in awareness. Instead of relying on cookie-cutter diet plans you will create your meals by paying attention to the true signs given to you by your body in regard to hunger and feeling satisfied. Each worksheet includes a to-do list and practical exercises designed to help you achieve specific goals. Some of the subjects covered include cravings, true hunger, smart snacking, exercise, triggers, and awareness training. As you progress through the sessions you will begin to naturally make adjustments in your thoughts and attitudes about food, dieting, and your body. Unlike most other diet programs you are not provided with a list of foods or a meal plan and are encouraged to resist categorizing food as “good” and “bad”. Rather you are advised to notice the effects that certain foods have on your body that may be unrelated to weight control. You may observe that foods commonly regarded as good, such as fruit and vegetables, have an important role in the proper function of your body. Also you might realize that some of the foods on your “bad” list, like nuts or cheese, have positive effects on your energy levels and wellbeing. Another part of this program that is different to most other diet plans is that you are asked to avoid pre-planning your food choices as much as possible. Instead you check in with your body right before eating to see what you feel like. The time it takes to complete the program will vary because every person is unique but if you do one session a week it will take about six months. By the time you have finished you will have a new outlook that will support a healthy lifestyle approach to weight management. The Awareness Diet does not recommend a specific eating plan however certain foods including string cheese, nuts, chocolate milk, whole wheat crackers, peanut butter, salami and protein bars are mentioned as being potentially good foods for snacking. This program does not include a meal plan and dieters are encouraged to discover the foods and way of eating that works best for them. In the exercise session of The Awareness Diet you are asked to exercise just twice for ten minutes. The reason you only exercise for a limited time is because the only way you will stay physically active on a consistent basis is if you enjoy it. Your goal is to find a lifelong routine that works and to achieve this you can try a variety of different activities until you discover the ones that are right for you. You may consider walking, running, cycling, martial arts and yoga. Some of the sessions include exercises to help you uncover how you really feel about exercising and to decrease your resistance and increase your motivation. The initial investment for is $65, which includes a $20 registration fee and three monthly fees of $15. After this you will automatically be billed a monthly fee of $15 until you cancel your membership. Increases awareness of food choices and eating behaviors. Dieters are not required to give up their favorite foods. Addresses the importance of emotional and psychological factors for effective weight loss. Advocates snacking, which can help to reduce hunger and overall calorie intake. Promotes an individualized approach to dieting and losing weight. Can assist dieters to overcome emotional eating and yo-yo dieting. Lacking in education about how to create a balanced nutritional intake. Precise recommendations for exercise are not included. Weight loss results may occur very slowly on this plan. Will not appeal to dieters where emotional or psychological factors do not appear to be the major issue that has caused them to gain weight. The Awareness Diet will benefit dieters where emotional or mindless eating is a major factor influencing their ability to lose weight. By increasing the awareness of your attitudes and behaviors regarding food and body image you will naturally gravitate toward the healthy choices that are supportive of long-term weight management.